I have could never find a good chance to update the blog. This is most likely due to the fact that I was out at sea for two weeks and no internet connection. Also might be the fact that I have too much to do and I’m always scrounging around to finish everything. I hope everyone is getting updates on our travels and experiences through the other blogs though. We have been through quite a bit these past 2-3 weeks. We set off on the end of April and headed out to look for the whales. Todd was a bit late picking us up that day because he had to go out to buy groceries to prepare for our two week departure. 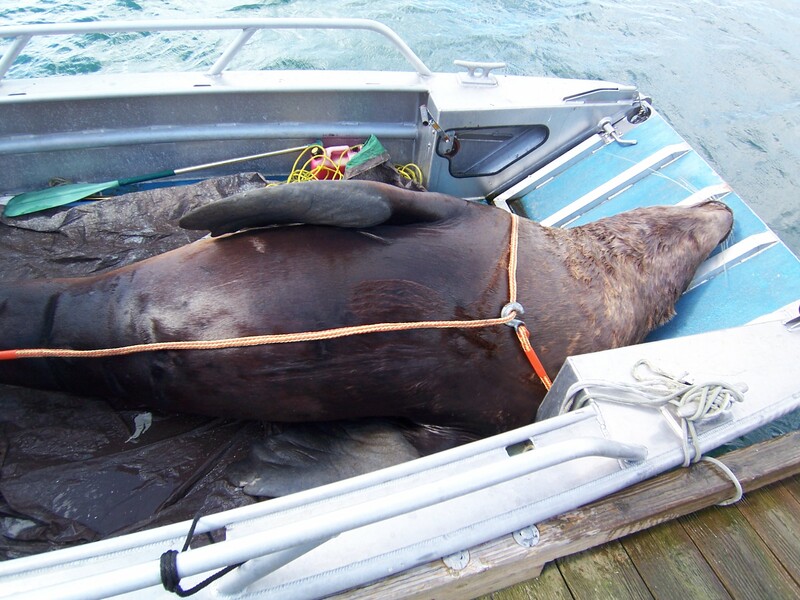 Jason also got a call from the Stranding Network about another Steller sea lion washed up on a beach on Orcas Island. We ended up departing at a very late time, but two weeks, I was looking forward to it no matter how late we left. The next day, unexpectedly, J-pod returned to San Juan Islands, after a long period of absence. 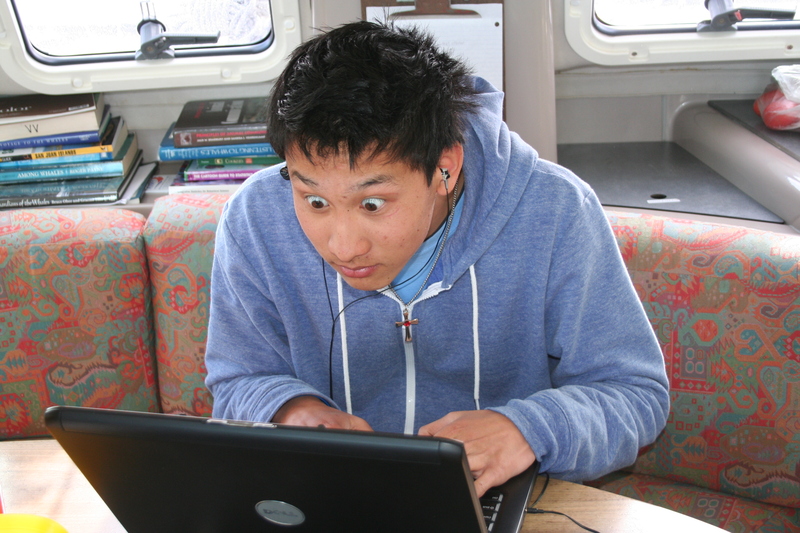 Jason heard the update right when we docked on Stuart Island; my heart jolted straight away. The residents are back! I was really excited from hearing this, trying to contain myself in the middle of Todd’s sailing lecture. We did peek our heads out off of Turn Point to see if we could spot them. We actually did too! They were pretty widespread, as I could only spot two females surface a couple of times. We believed them to be foraging around that time, which was 6 pm. But the next day, they were gone. No updates left of the residents, which made us sad. The salmon runs are probably not quite here yet. The next few days, we did not hear from Orca Network about any updates on the whales’ whereabouts. We did see quite a number of other marine mammals though, such as harbour seals, dall’s porpoises, and more. But getting lots of science goals out of the way was really great. 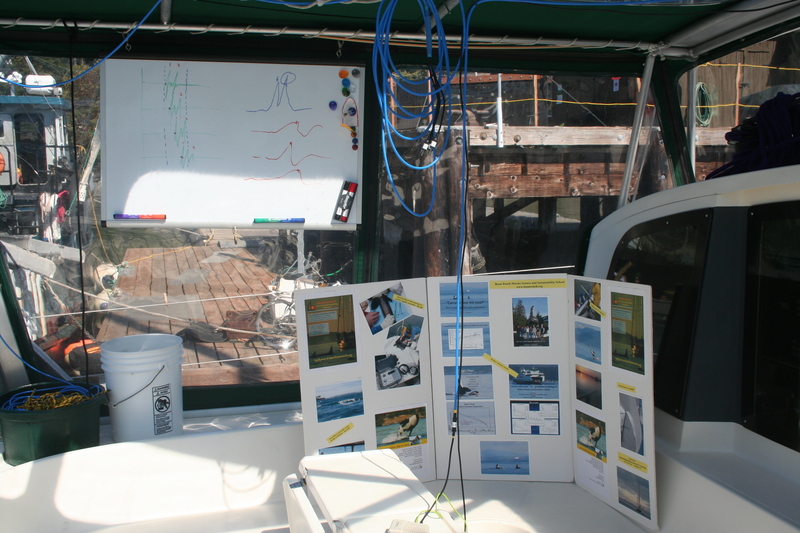 We calibrated our hydrophones, went through a behavior exercise with Jason on the Gatito, had a couple of sailing lectures, wrapped up our final research proposals, and journal club readings. It was sort of nice that the whales did not come by during this time, because it was indeed crunch time when we had to finish up our proposals. I can recall I was one of the ones that were sleeping later than usual, with my eyes popping out of their sockets from working on the proposal for hours. We finally turned it in on Friday, after what I felt was a long process of hard work. But, before turning the proposal in on Friday, transients! We were stationed out by Turn Point for almost the entire week, drifting about, waiting for the whales to show up. It was on May 7 that we finally got to see the whales. We got the text that there were two transients heading north on San Juan Channel. Perfect! We were right north of them, heading south. In that sense, we immediately headed down towards them, in hopes to catch them on camera and film after not seeing whales for a long period of time. We motored all the way down towards Orcas and saw several boats off in the horizon. We thought that they were the whale watching fleet out there, and sure enough, they were. There must have been over eight of them surrounding the two whales. It was much more different than the time that Kathryn spotted the whales when we wanted to go to Neah Bay. We were practically the only ones following them. 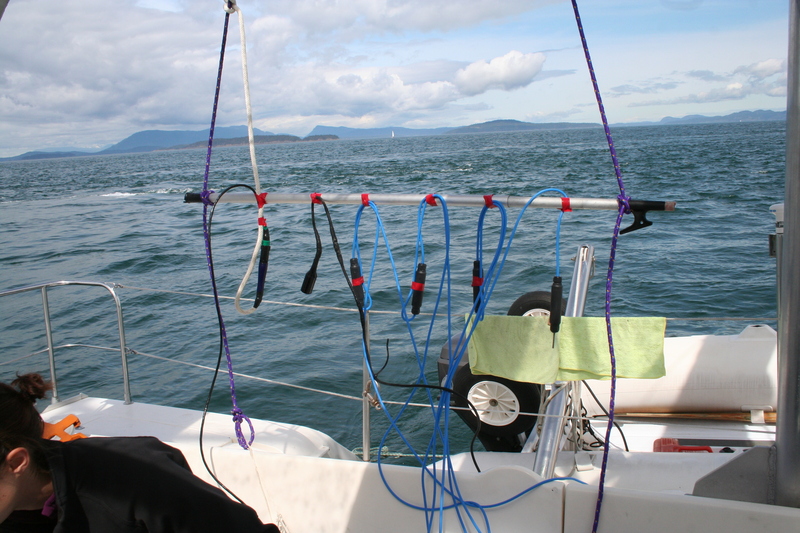 This made such a huge difference for us, since we had to tow the hydrophones this time to get recordings and boats kept getting in our way. It was seriously very frustrating. But we did get a great recording of what we thought of as a call around 17 minutes into the recording! Afterwards, we sailed back to Friday Harbor Labs in preparation for the open house that was going to happen. The open house was an event in the labs where the area is open to the general public. All the students at the labs get to show off what they have been doing this whole time in the labs and demonstrate what they have learned so far. I thought that this was a great time for everyone to share their findings and interests to the public, hoping to educate them as well about the science out in the world. For their service project, Libby and Kathryn went to a walk to spread awareness about the salmon farms at Vancouver Island and Alexandra Morton was going to be there. She was one of the leaders and since it was during the exact same day as the FHL open house, Nora and I had to take over the entire chore rotations and make sure everyone was attended to during the event. The open house was a success. I loved every bit of it: the enthusiastic kids, parents that had loads of questions, and all the FHL folk that came down to take a gander at the Gato Verde. I really felt my communication skills come out during that day, since several times, Jason and Todd were occupied with another person and I would have to take over along with Nora. Even better, was the fact that it was such a nice warm day. During my break, I went over to visit the Zoobots and Kellen’s genomics class to see what they were up to. I ate some gummi worms while investigating the labs, and learned some pretty neat stuff! Vincent showed me this hermit crab that had a mutualistic relationship with a sea anemone that lived inside of the shell. Whenever the hermit crab was fed, the tentacles would pop out, and gather and food. That is just crazy! I saw scallops also flip around and swim too, rather quickly I would have to say. But all in all, it was such a great day. To top it off, we had internet and stayed another night at the labs. That meant another night of soda, showers, and comfy rest. It was then, during the next day, that we saw two transients again. We crossed the Canadian border and found two whales being followed by about 8 vessels once more. We were at first very far out so it was difficult to see them. I had the camera for the first time and it was hard for me to get shots of them since we were facing right towards the sun. I tried my very best. This time though, it was much more exciting than the day before. We got to be able to see them act quite strangely. For one, they started heading towards a boat and not going away from it. 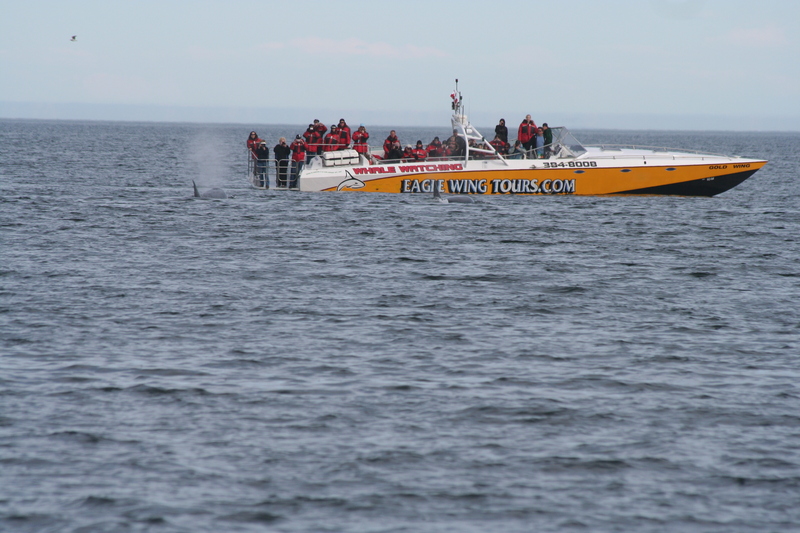 We thought that there was perhaps a seal or something heading underneath the boat that the orcas were that interested. But for a solid 10 minutes, it would not leave the vicinity of the boat. The whales kept bobbing up and down around the Prince of Whales and stayed there for a long time. They did the exact same thing to Eagle Wing. What was most memorable was when we saw lots of great splashes and some interaction between the two whales. And…what was most intriguing was that we thought we saw a bit of pink flash on the surface of the water. Sea snake perhaps? 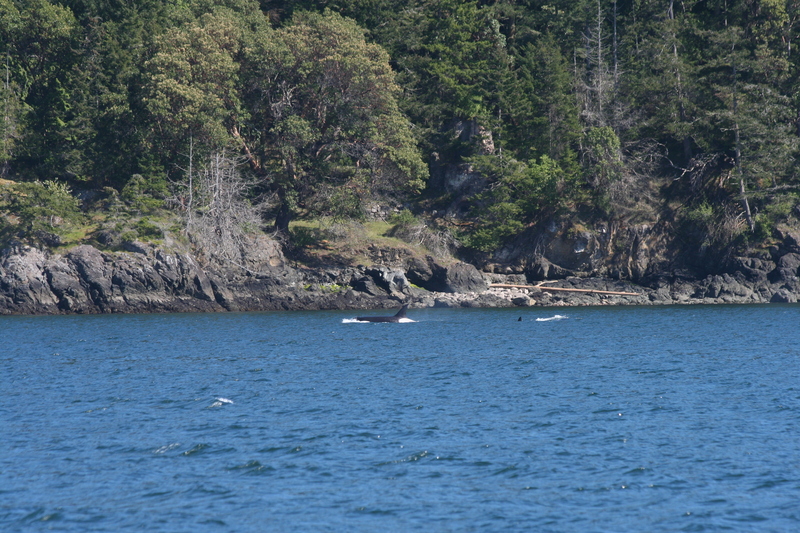 We all shouted and exclaimed in excitement over the orcas as they were just a spectacular sight to see, yet again. I felt as if these two weeks zoomed by so quickly, that I did not even notice. Time never waits for anyone does it? But we did accomplish so much, and I have felt that I have grown so much since the very first day of Beam Reach. I am constantly learning, being the youngest and only teen of the group. I have a long way to go but I aspire to end with lifetime lessons and exuberant experiences that I can share to my folks back at home. Another week has passed here on the San Juan Islands, and overall, it has been an adventure indeed. This week, logistically, we went over a lot on statistics, acoustics, and equations that would scramble the neurons in your brain. I did my best to keep up with the work. On Monday as I recall, we were able to head down to the dock to collect sound data. We all had great practice in using the sound equipment, in preparation for our main research projects that are coming up. Gathering the data was a lot of fun, because we finally got a chance to get hands-on with what we were doing. We hung a speaker on one side of the dock and kept it there, as we inched our way down the dock with the hydrophone, measuring at different distances. With the data set we collected, we used what we learned in statistics and sound to start on our dock spreading exercise. 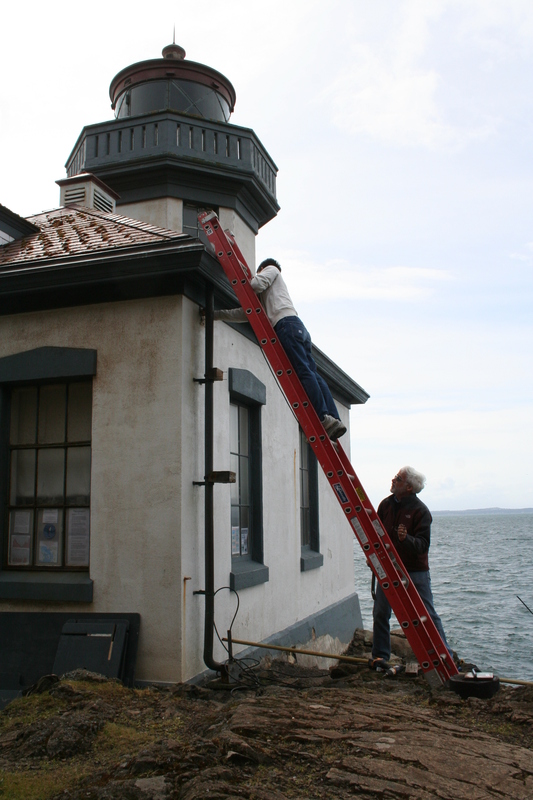 On Tuesday afternoon, we went back to the Lime Kiln Lighthouse to do some cleaning! It felt very refreshing to just contribute to the status of the lighthouse itself. I helped Val move the lighthouse antenna to the top of a tall post nearby. It was a hassle to get through those feisty tree branches, for me and Val had an interesting time maneuvering through the branches with the ladder and our bodies. Once we got it up there though, we felt really accomplished with our task. Better yet, before we even got the antenna attached to the pole, Val climbed up the ladder to dismantle the older satellite dish. And guess what? It was supposed to come crashing down like we predicted, but those branches supported it. Anticipation of a giant falling satellite dish was ruined. But the entire afternoon was sort of an adventure already. But the unexpected granted this week to be really adventurous indeed. Jason got a call to go pick up a Steller sea lion corpse off on one of the islands. And he called us to come along. So on Thursday, we needed out on the Buzzard, a small research vessel, to retrieve the corpse. It was a semi-windy afternoon when we left. We found it drifting alongside the shore of Lopez island. It was the first time I have ever seen such a humongous sea lion this close. It must have weighed over half a ton. After a tiresome couple of heaves, we got the humongous sea lion on board. However, the wind prevented us from going any further out in the open waters and thus, we had to leave it tied to the dock for the night. Even though we were not able to bring it back that exact moment, we began our trail back to the labs. The wind eventually grew much stronger, and water began to find its way into the boat. Because I sat on the front alongside Kathryn to balance the Buzzard, we ended up getting soaked from head to toe. But the whole journey was filled with nothing but jokes and laughter, even if we were getting pelted to the face by salt water. The next day, we set our course towards Lopez Island once more to retrieve that sea lion. This time, the sun was out with the least amount of wind that I have experienced here on the islands. Once we brought it back after an hour long boat ride, we contacted the people to perform a necropsy on the sea lion. I have never been so intrigued about anatomy in my life, after seeing a grown male Steller get dissected in front of my eyes. And to top the morning off, we were taught how to sail by Val in the afternoon! Nora and I made a couple of 360 degree turns out in the waters as Val and the others laughed. We figured how to get back to the dock eventually. We finally finished our research proposals on Thursday and just got them returned an hour ago. It is soon getting closer and closer to the day when we actually can sail out and do our research!